You would think the Mets would be an easy mark for the Dodgers. After all the New York club is horrible this year. They’re mired in fourth place and 13 games under .500. Once you get into September and get this close to the end of the season you find out that sometimes those non-contenders can be tough to beat. The reason why is because they have nothing to play for. While the Dodgers are in the midst of a nail biting palm-sweating playoff race, the Mets are just playing out their schedule. There’s absolutely no pressure on the Mets because they’re well out of the postseason race. That can make them dangerous. The Dodgers found that out the hard way in their 4-2 loss to New York in the series opener on Labor Day. Even with that being said, the Dodgers are still clearly a better team. The two teams did battle again on Tuesday night and the Dodgers flexed their muscles, overcoming an early 4-0 deficit to maul the Mets 11-4, evening up the series. Arizona and Colorado both won so the Dodgers remain a half game out of first place. The all-righty lineup finally delivered for the Dodgers against left hander Jason Vargas. Unlikely heroes like Austin Barnes, and David Freese were the catalysts for the Dodgers in their come from behind win. Vargas had been pitching better baseball, posting a 1.99 ERA over his last four starts. That didn’t last long though as he allowed five runs on six hits over 3.1 innings. The Dodgers were 4 for 11 with runners in scoring position on Tuesday, tallying 13 hits including six extra-base hits, two of them being home runs. The boys in blue scored two in the third, three in the fourth and six runs in the bottom of the seventh. The game started out poorly though as the bats couldn’t get a base runner in the first two innings and starter Rich Hill had a rough beginning. The Mets hit a pair of two-run home runs against Hill. One was hit in the second and the other in the third as the Mets jumped out to a 4-0 lead. With Todd Frazier aboard, big man Jay Bruce hammered one (a Moonshot) to right field to put the Mets on the board first. In the top of the third, Michael Conforto bombed a two-run shot of his own to give the Mets a four run lead that honestly seemed a little insurmountable with the Dodger’s weaker hitters in the lineup. However the third and fourth innings were the Mets’ undoing. Some timely hits, and sloppy New York defense allowed the Dodgers to not only tie the score, but take a one-run lead. Wouldn’t you know it? The little righties that could provided the pop. 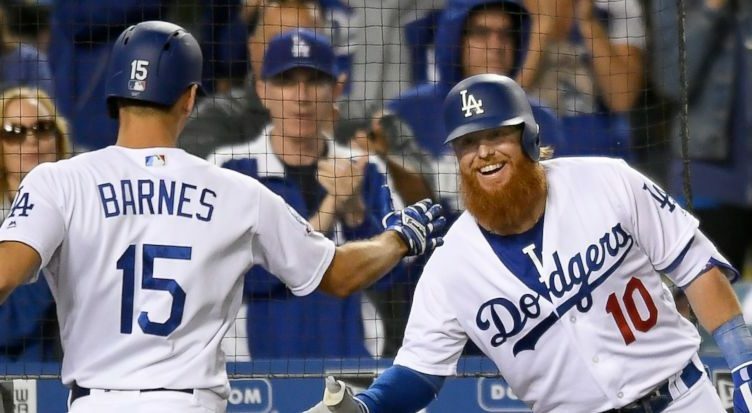 After Chris Taylor worked a walk to open the bottom of the third, Austin Barnes slashed a two-run shot into the left field seats to cut the New York lead to 4-2. That’s just the second home run of the season for Barnes, who now has 10 runs batted in on the season. I honestly thought that Haley’s Comet was passing over Dodger Stadium. (Checks records) No, the famous terrestrial event will not occur again for another 43 years, but I think the Barnes home run was just as rare. We may never see it again. The inning continued with Hill singling to right and then getting erased on a Brian Dozier force out. Manny Machado singled Dozier to third, but the Dodgers couldn’t get anything else. In the bottom of the fourth, good guy David Freese hit his first home run as a Dodger, a rocket into left center field orbit. Enrique Hernandez beat out an infield single and Chris Taylor doubled him to third. Barnes chopped one to third that Frazier completely butchered allowing Enrique to score and tie the score at 4-4. With Taylor at third, Hill tried to squeeze in Taylor, but the Mets quickly cut him down at the plate. After a New York pitching change, Barnes steals third off of Tyler Bashlor. Dozier’s RBI ground out scores Barnes to put the Dodgers up 5-4. Meanwhile Hill pulled off quite a turnaround. The southpaw curveball spinning master didn’t allow anything over the next several innings. Hill would strike out 8 over six innings while allowing four earned runs on seven hits. He didn’t have his best stuff, but he didn’t give up and kept the game within reach. The Dodgers would add more runs later, but not before the Mets gave a scare in the top of the seventh. With Pedro Baez on the mound, Ahmed Rosario’s pop-fly double fell in the Dodger Bermuda triangle just barely grazing the right field foul line. Originally ruled foul, the Mets challenged and won. Rosario was awarded second base. Jeff McNeil’s grounder moved Rosario to third. With two outs, Wilmer Flores grounded one to short. Machado’s throw pulled Freese (playing first base) way off the bag, but the veteran made an outstanding play to catch the ball and then tag Flores before falling over and tumbling to the ground. What a play! In the bottom of the seventh the Dodgers connected for five consecutive hits and six hits overall in the inning. Turner and Machado started it with back-to-back doubles. With Matt Kemp at the plate, Corey Oswalt uncorked a wild pitch and Machado stormed all the way from second to score. That made it 7-4 Dodgers. After Kemp walked and Pinch-runner Tim Locastro stole second, Freese doubled him in to give the Dodgers an 8-4 lead. Hernandez singled in Freese to extend the Dodger lead to 10-4. Later in the inning Yasmani Grandal’s RBI single plated the eleventh run for the Dodgers. With the win well in hand, the Dodgers let Josh Fields get some work in the top of the ninth. He looked horrible, loading the bases with nobody out. Dave Roberts was forced to bring a hook and handed the ball to switch-pitching Pat Venditte. Wouldn’t you know it? The Mets did not score. This is the first time in a week that the Dodgers scored more than three runs. Let’s make this a daily thing ok Dodgers? The two teams wrap up the series in Wednesday’s rubber match. Zack Wheeler counters Hyun-jin Ryu with the first pitch scheduled for 4:35 PM PST. Not impressed by the win, and I really don’t like the way we are approaching the game on offense. It really seems like one big slide from WS Game 7, where somehow we think “bad luck” just happened and if we had played that game again in the same way 10 times we’d win more than we lose. I just don’t see it that way. Our hitting got exposed in that Game 7 and doing it the same way just won’t work against contenders. This season is sure playing out that way, and I don’t expect our pitchers to bail us out like they did against he Diamondbacks (and even then, I note that the Diamondbacks were in a slump coming into that series). They won and beat a team they should beat. I also was not impressed by the win, and I saw little to like. Yeah, they scored 11 runs with some help from the Mets defense and a Mets relief corps that allowed no relief. IMO, the stats stats of lefties vs. righties are skewed and unreliable. Today, a batter is “branded” with the ideology that they cannot hit lefties or righties, so they get very few chances to improve their numbers. Say you are a lefty. In today’s baseball, you get very few at bats vs. a left handed pitcher. The few at bats you might get you come in cold off the bench. My belief is that if you are hot, and seeing the ball well, you can hit anything, regardless of which side of the rubber the ball is coming from. You are comfortable and confident, where as if you are “branded”, your confidence is low, and you press yourself into swinging wildly in an effort to prove the nay-sayers wrong. Baseball is a very mental game. 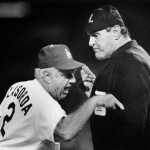 Undermining a player’s confience is detrimental to the game. Also by setting all-righty or all-lefty lineups, you give the opposing pitchers an advantage by not having to make adjustments through the lineup, depending on which side of the plate the batter is on. Easier for the pitcher to get into a groove. I dread the all lefty, or all righty lineups.